Whelp. This will be a post full of mediocrity. As a Sephora VIB Rouge member, I was able to order a free trio of Clinique’s Turnaround products in deluxe sample size. When my order arrived, only the oil came with it. I’m sure the other two samples simply ran out; I waited a whole three days before taking advantage of this freebie. Nevertheless, I’m not too upset because I only really wanted the oil, but the others would have been nice too. Since that’s what I was promised and all. I won’t make a fuss because I’m not a huge fan of Clinique, and I was not surprised when using this oil. First, a little bit about Clinique. 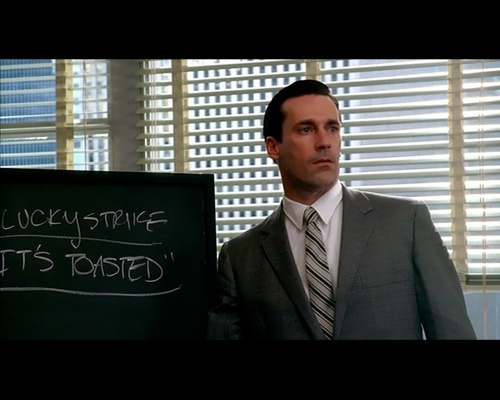 I don’t buy their “dermatologist tested” claims because it reminds me too much of the Mad Men episode in which Don decides Lucky Strike should advertise their products as “toasted.” Even though all cigarettes are toasted, it makes them stand out. Now, Clinique does say it was the first cosmetics company to use dermatologists, but it is nowhere near alone, nowadays. It’s also an empty claim, for a singular dermatologist doing a simple test on one product would technically make it “dermatologist tested.” Furthermore, the tests are not peer-reviewed, and are typically done by scientists and dermatologists who work for the company in mind. When I worked for Estee Lauder, Clinique customers drove me up a wall and down the other side, because Estee owned Clinique and therefore had all of the same testing; they probably shared research, too. Clinique also tests on animals, for anyone who wants to avoid companies who do so. I do have to give Clinique credit for being fragrance free. Fragrance = alcohol which is a drying agent. I like good smells as much as the other girl, but they seem unnecessary in a skin cream. Onto the oil! It’s main ingredient is a form of coconut oil, which was fairly impressive because I half expected to be mainly silicon or something like that. Coconut oil is slightly problematic because plantations are cropping up due to its popularity, but the industry isn’t nearly as harmful as the palm oil industry which cuts down rain forest to plant trees for oil. The disappointing part is that it was SO DRYING. I got it and then washed my face and tried a few drops. At first, it seemed lightweight and lightly moisturizing. Not quite as heavy as my other oils, but faster drying. I feel the need to say here that I’ve tried lots of skin oils, so I’m used to very moisturizing formulas (and I’m planning on making a large post comparing them (I’ll link it here when I’m done)). But, after about ten minutes my skin felt very tight. It wasn’t a “firm” tight but an uncomfortable, dry feeling. I had to go put on moisturizer just to feel comfortable again. Is this a great oil? No. Is there a person it could work for? Maybe. If you have oily skin and are really scared of using an oil, maybe start with this but a SAMPLE of it, because at 38$, I’m really not sure it’s worth the investment. Is A Keratin Treatment Worth Getting? Your posts are amazing, I really like your blog! I just followed, it would be great if we can support each other 🙂 I can’t wait to read more! aww, than you so much for the kind words! I’ll certainly support your blog 🙂 I love how the blogging community is so helpful.